DePaul students with their haul (left to right): Rima Mandwee, Brianna Kelly, Melanie Stone, Tyler Carter and Jakub Rudnik. DePaul University College of Communication journalism students won 23 awards, including seven first-place wins, in the SPJ Region 5 Mark of Excellence Awards on April 12. The Region 5 awards recognize the best student work in Illinois, Indiana and Kentucky. The winners advance to the national SPJ Mark of Excellence Awards, which will be judged in May. 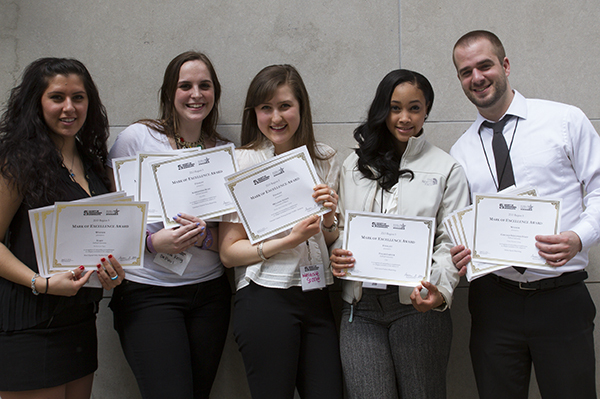 The 23 awards are the most DePaul has won in the four years participating in the competition.